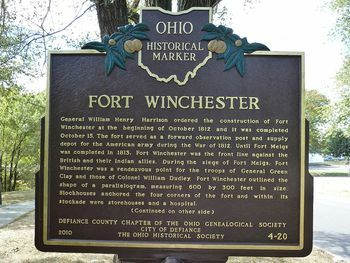 Fort Winchester (1812-1815) - Established in October 1812 during the War of 1812 by troops under General William Henry Harrison. Named after BG James Winchester, Revolutionary War officer and commander at the Battle of Frenchtown in 1813. Abandoned in 1815 after the end of the War of 1812. Built as a forward observation and supply post for General Harrison against the British and their Indian allies. 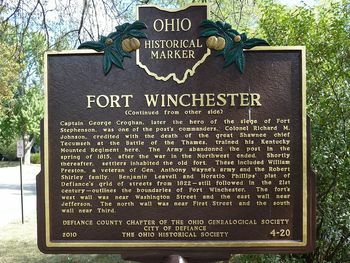 Fort Winchester and nearby Fort Defiance (5) were on the front line of the conflict until Fort Meigs (1) was completed near the British at Fort Miamis. Fort Winchester was built as a 600' by 300' rectangular stockade with blockhouses at each corner. The post was abandoned in the spring of 1815 and settlers occupied the buildings. Markers only. No period guns or mounts in place. Location: Defiance, Defiance County, Ohio. This page was last modified 08:53, 26 March 2019 by John Stanton.